Lhoksemaweuh is one of the largest city in Aceh, that lies between Banda Aceh and Medan. 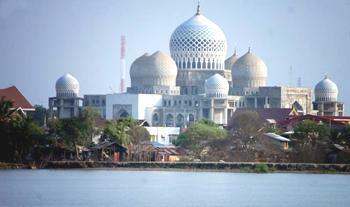 This city has an important role for economic in Aceh. The name of Lhokseumawe taken from the word “Lhok” (deep) and “Seumawe”, that means swirling water in the sea. It can be seen in the area of it, where it located at the offshore of Banda Aceh and its surrounding. At ancient time, Lhoksemawe was part of Samudra Pasai Kingdom in 13th Century, that later becames part of sovereignty of Sultanate of Aceh since 1511. Ujung Blang beach is one of a famous beach in Lhokseumawe. This beach stretch of the river kuala cangkoi, and it covering four region of Ujung Blang village, Ulee Jalan village, Hagu Barat Laut village, and Hagu Tengah village. Ujung Blang beach is named after the village where the beach is located. Meaning "Sawan Blang" own in aceh is "convulsions" ends and means "Blang" means or stretch of farm fields. Because at first, Lhokseumawe region consists of acreage of rice fields, marshes, and vacant land. Rancong beach is located next to Seumadu Island, and becomes one of the popular one for nature sightseeing in Aceh, especially in Lhokseumawe. This beach is suitable for recreational place for family, packs of best friends or love one. Shaddy trees, windy nuance and bright sunny day is the things that you will get while visiting this beach. Located at 10Km east of Lhokseumawe, Seumadu Island is precisely settled in Muara Satu, and have known as Rancong Beach. The island is famous for its natural beauty that makes this place been visited by many visitors.